Where to turn for income after Brexit? Watching the markets react to the Brexit vote has been fascinating. Sterling’s plunge versus most other currencies was entirely predictable. 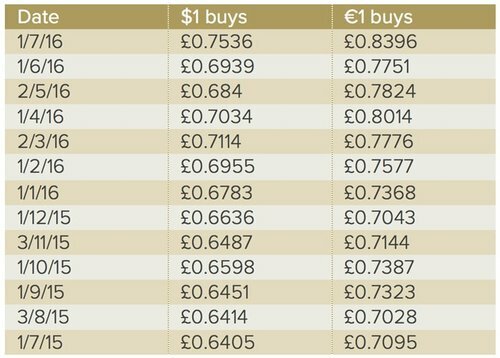 Indeed, the table below shows how it has steadily depreciated against the Euro and US dollar over the last year, followed by a recent sharp fall. However, seeing the FTSE 100 reach the highest point in virtually twelve months has been a surprise. In my view this has partially been driven by currency movements. Studies show approximately 70% of FTSE 100 earnings come from overseas. More interestingly, the impact of the currency depreciation will most likely boost dividends and profits as many large multinationals, such as HSBC, BP and Astra Zeneca, report their results in US dollars. However, with the Governor of the Bank of England, Mark Carney, strongly hinting late last week that interest rates would be cut very soon, income-producing assets will become ever more sought after. Gilts have fallen to record lows in the UK, with the benchmark 10-year gilt now yielding a miserly 0.85% and the 30-year gilt only 1.67%. Who would seriously lend money to any government at those levels? 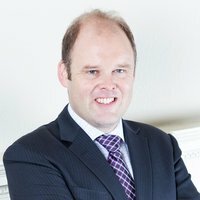 The first port of call for investors seeking income was traditionally savings accounts, but I know from recent personal experience that achieving anything over 1% per annum in interest is virtually impossible. If you are prepared to tie your money up for a few years, you may get 2%. Similarly, corporate bonds, long the cornerstone of many investors’ portfolios are now suffering from low yields as their pricing is typically derived from the gilt yield. Equities can still offer decent income and capital growth prospects, with the FTSE 100 yielding 3.8% today, and with the plunge in sterling this could well increase. The level of cover on these dividends though is at the lowest point since 2009 as companies become more stretched in maintaining their dividend in the face of stalling profits. Please remember though investment value and income are not guaranteed. So where can income seekers turn? At Wealth Club our aim is to break away from the norm and offer you more compelling investment opportunities. Two such opportunities, detailed below, may be an option for more sophisticated investors. Crowdfunding had a bad name in my view. Most of the money raised was equity fund raising for small, start-up businesses. Investors were encouraged to invest on the lure of big returns. The likelihood of seeing those big returns was slim. However, like every sector, crowdfunding is maturing and offering new and interesting opportunities. Crowd bonds are one of those. Rather than investing in the equity you lend money to an unlisted business via a bond. Of course, this is not risk free. You can still lose your money. If you invest in the equity, you only have a chance of making your money back if the business is profitable. If on the other hand you lend money to a business, that business should only need to remain solvent for you to make your money back. Clearly, there’s a significant difference between profitability and solvency. When you lend money, the business may have assets to put up as security against the money it is borrowing. Downing is a company I have known for almost 20 years, through its VCTs, and latterly its EIS and IHT investments. It’s the first established fund manager to enter the Crowdfunding arena. Downing does the due diligence, structures the bonds and assesses the level of asset backing prior to inviting investors to invest. What is so interesting about the four bonds currently on offer is the high rate of interest compared to the low loan-to-value ratio (the ratio of assets in the business compared to the money it is borrowing). Annual interest rates currently range from 5%-7%. Please remember: capital is at risk and returns are not guaranteed. These bonds are not readily realisable. When VCTs first launched in 1995, many thought of them as a growth product – they were investing in small unquoted companies so surely that’s what they were? Right? Well in my view, that has always been wrong. They have always been an income-producing investment. Dividends are paid to investors tax free from either income or capital. Managers are encouraged to pay these dividends. Those who have focused on paying consistent dividends over the years have been rewarded by investors who repeatedly invest new money with them each year. Whilst most VCTs typically launch their fundraising effort in the Autumn, there are some quality VCTs open today with access to immediate dividends from the likes of Amati and Hargreave Hale Dividend yields of 4%-5% are fairly typical. Don’t forget to achieve a 5% dividend yield from a taxed investment, a 40% tax payer needs a yield of 7.4%. Please note: VCTs are not for everyone. They are long term, higher risk and more illiquid than other investments. The value of tax benefits depends on circumstances and tax rules can change. Before you invest please ensure you’re familiar with a product’s features and risks.